≈ Comments Off on Save Oakton! The current owners, Will and Michelle Goodman, purchased the property intending to keep the property in the Goodman family. They operated an event company specializing in tours, classes, and gatherings for all sizes. In addition, they started a local farm-to-table movement, selling products at the weekly farmer’s market and online. However, the time has come where they want to retire. The property sat on the real estate market for 2 years. There has been interest in demolishing the home and building a residential development. If this happens, then we will lose Oakton’s history. Please contact local council members asking for the city to save Oakton! The Save Oakton Project Facebook group (https://www.facebook.com/saveoaktonproject/?ref=br_rs) was created to disseminate information and updates. For more information on the house, visit http://www.oaktonhouseandgardens.com/index.html. Strange lighting makes the living room appear spooky. Winter weather brings about new sounds from my house. It moans. Actually, only one side moans, but it moans nonetheless. These seasonal noises are remarkably loud. One would think my house is haunted. But it’s not. Drat! However, Archer Paranormal Investigations (API) has conducted a few investigations where the clients think their house is haunted only to find that it isn’t. In the movie The Conjuring Ed and Lorraine Warren investigate a young couple’s attic and discover that the “ghost” was a creaky floorboard. This is sometimes the case. Good paranormal investigators check it out. Period. Back in the Victorian Age, the prevalence of gas lamps in the streets created the “Haunted House Syndrome.” Excessive exposure to carbon monoxide (CO) caused people, entire families even, to claim their house was haunted. These people experienced hallucinations which they believed were caused by paranormal activity. Today skeptics attempt to debunk haunted house sounds by claiming over-exposure to different chemicals. And this may be the case. However, that is a generalization. One of the easiest, and safest, ways to debunk strange noises in your house is to purchase a carbon monoxide detector. In fact, you should buy one for each floor. 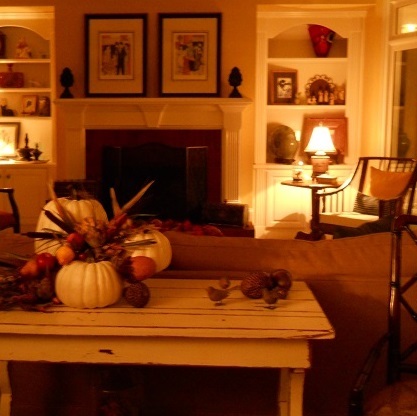 Carbon monoxide is known as the “Invisible Killer” since it is colorless and odorless. According to the Consumer Product Safety Commission, more than 150 in the United States die per year from accidental CO poisoning. Not only will it provide peace of mind, it may save your life. 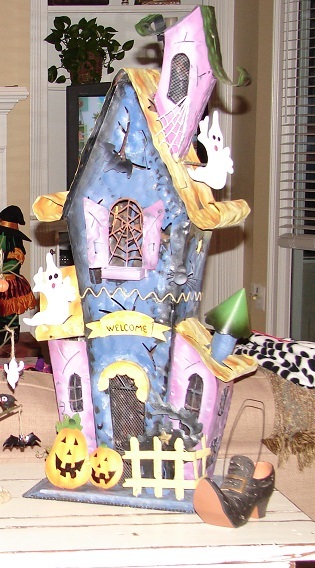 The only way my house is really haunted–Halloween decorations. 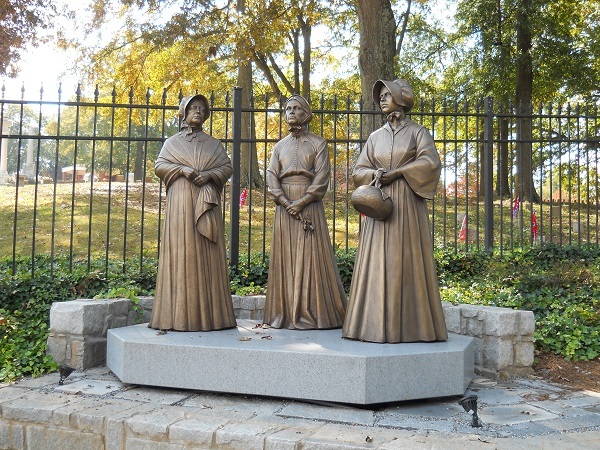 A new statue was unveiled at the Marietta City & Confederate Cemetery representing the Marietta Ladies’ Memorial Association members who single-handedly gathered and re-interred the dead Confederate soldiers. They represent Jane Glover, Mary Green, and the third statue represents all of the other women who worked to make this cemetery possible. Read the article from the Marietta Daily Journal at this link: http://mdjonline.com/view/full_story/23631531/article-Marietta-plans-big-weekend-for-150th-anniversary-of-cemetery. 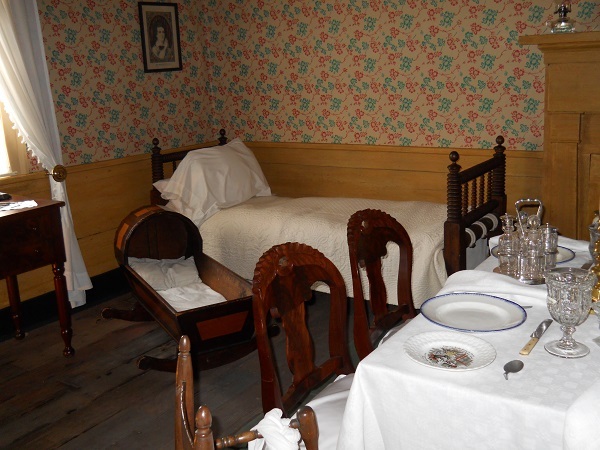 One of the oldest and well preserved homes in Marietta is the William Root House. Built facing the Marietta Square circa 1845, the home is a great example of Middle Class America. The wood frame home has been relocated three (3) times. Initially, it stood 1) at the intersection of Church Street and Lemon Street where it was enlarged, then 2) moved further down Lemon Street in the 1890s, and finally 3) at Polk Street and the 120 Loop in 1990. The house was slated for demolition but was donated to the Cobb Landmarks and Historical Society. In addition to the main house, there is a detached kitchen, outhouse, and garden on the property. 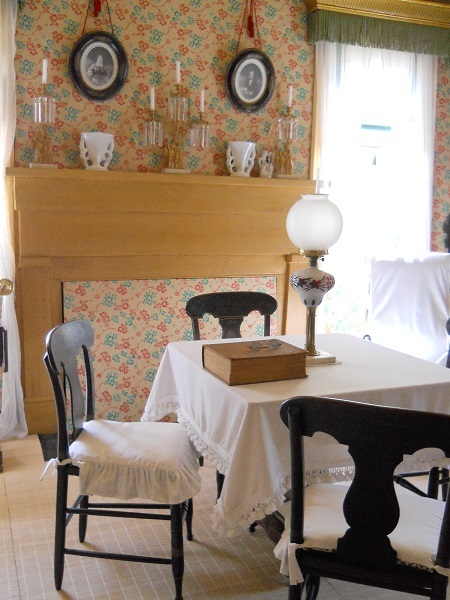 The kitchen exemplifies a working kitchen from the time period—complete with a fake bird that would have indicated carbon dioxide fumes and warned the family. William Root was Marietta’s first druggist. He married the former Hannah Simpson. They had four (4) children. I believe that the Root line dried up with William’s children. William was one of the founders of Saint James Episcopal Church, located in downtown Marietta. After his one son died, William’s business failed so he took a job with the church. William served as the county coroner for two (2) terms starting in 1883. William died in 1891 and is buried in the Marietta City and Confederate Cemetery. Urban lore is that the ghost of Hannah Root can be seen in the second floor window. This has not been verified. However, the docents surely bring the family to life in their period clothing and retelling of stories.